His body goes limp in my arms, still young but not-so-little. He screams, thrashes, brings himself to the floor. 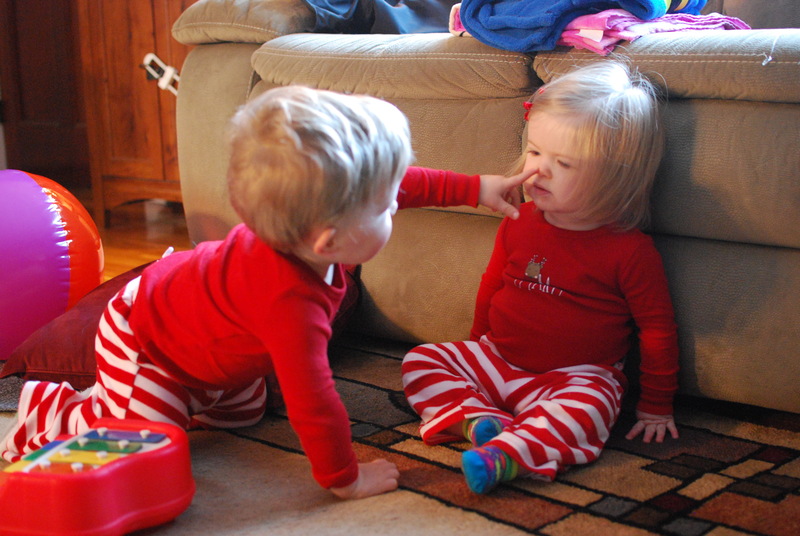 He didn’t want to brush his teeth, but he didn’t want his twin sister to have teeth time with me either. He wanted to be first, and to also not brush his teeth. I stay calm, for now. Looking at the clock. Bedtime is here, and every minute we wait is one more minute this child is tired. Very tired. The meltdown continues for a long, long time. 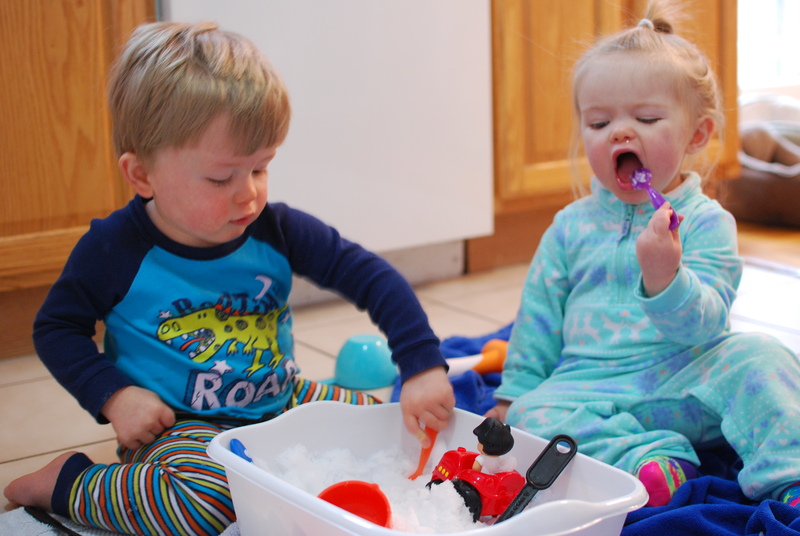 Through the brushing of his sister’s teeth. Through the reading of a story to her that he couldn’t bear to listen to or be a part of. Following us into the next room, eyes full of tears, screaming, getting close to my face and saying, “Mommy, I want to HIT you.” Waiting for my reaction as he says it again and again. He never does hit me. Sister’s book is over, she’s ready to head up to bed. He wants to brush his teeth with me now and I give him one more chance. “Are you ready to brush your teeth right now?” “YES!” he screams. I head over to the table and he….collapses onto the wood floor. He’s not ready. With no time to spare at a time where this boy desperately needs to sleep, I’m forced to carry his 35-pound self up the stairs, giving him the choice along the way to walk. He can’t do it – he can’t stop screaming, thrashing, doing anything he can to get out of my arms. Pregnant, guiding sister up the stairs ahead of us (and praying she doesn’t slip) I hold on as tightly to his wriggling body as I can. Knowing in my heart that I won’t drop this child. And I don’t. We make it up and I know it won’t get any better. The sadness starts to creep in. He’s so angry he’s simply screaming a sound with no words. How sad to end our day together this way. The night before I have to go back to work. Where we could be doing hugs and “I love you”‘s, and we’re not. I can’t even communicate with him. 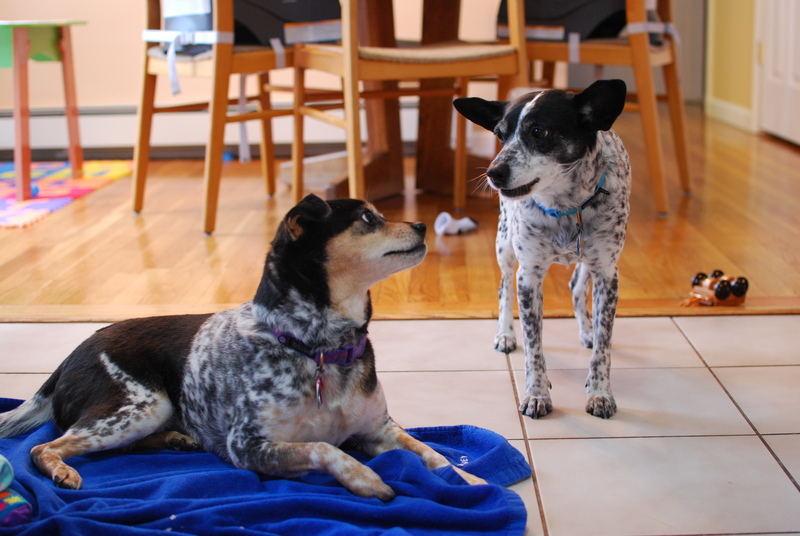 Sister starts to get upset, as her routine was disrupted too. The hug they give each other before cribs – he can’t accept it. She wants to give it, open arms ready. And I just won’t do. At that moment I feel sad for her, too. She wants a routine, she’s ready to comply, she loves her brother. And he can’t see that right now, he can’t see through his own tears. I can’t believe it. He never asks for a kiss. How could he have known that asking for this little tiny thing brings me full circle, from angry to frustrated to sad to…the deepest level of love. This boy puts me through the ringer. He gets his kiss (or 5) and I promise him that I love him, that everyone loves him, that it’s okay to be sad. And then, that his lovey is sad too, and could he make Lovey feel better? He lays down, finally. Snuggles Lovey. I say goodnight and “I love you”‘s to both babies; there’s a little protest but he’s still lying down. By the time I get down the stairs he’s snuggled up in sleeping position (always on the belly). I’m mentally drained, still sad, still full of so much love for both of my perfect, imperfect children that my heart might just burst. The carton of ice cream and a spoon join me on the couch. This night is effectively over. But he doesn’t answer. He’s already dreaming of tomorrow. 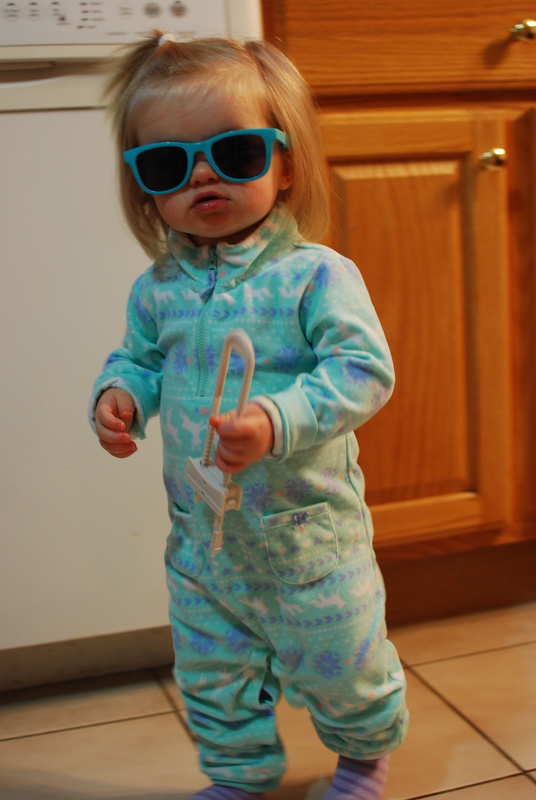 For those of you who are new followers to this blog, my husband and I cloth diaper our 18 month old twins and have done so for exactly a year now. But let me back up. Like most people of my generation, I was raised in cloth diapers. I was told the story a million times of how I almost swallowed an open pin (eek) and how heavy the bucket of sopping wet diapers would be when it was taken to the washer. Neither one of those things sounded appealing to me. But it saved money. It was so CLEAN – think fresh smelling laundry, drying out on a line in the summertime bleaching in the heat. It’s just what people did. So before I was pregnant, cloth diapering was not something I was scared of and I hoped to do it someday. Well, we received TONS of disposable diapers as gifts before the twins were born, which we were more than grateful for. Boxes upon boxes. It was wonderful. In the back of my mind I thought, “Maybe someday I’ll still make the switch to cloth.” But honestly – I am SO glad I started out with those disposables. Life was such a blur. My husband and I were doing round the clock double feedings for months. My daughter was a non-stop crier. It was just so hard to be a mom for a little while. Who has time to think about alternate ways of diapering a newborn? Not this mom. I needed to slap on a diaper super quick and whisk it away when it was full of poop. I did notice that the twins got diaper rash a lot but it was still worth the ease. Life started to become a little less hazy around 4-5 months. I didn’t feel like I was walking around drunk anymore. I could experience normal feelings again that weren’t clouded by utter exhaustion. I could THINK and not just react. Coincidentally, that’s about when our disposable diaper stash ran out. I was actually going to have to start buying diapers. I joined a babycenter.com cloth diapering group just to get a sense of what cloth diapering was all about in this day in age. Yes, there were still people out there who took the white diaper (otherwise known as a burp cloth in our house), folded it up and pinned it to the sides. But for me, that wasn’t going to work. Ain’t nobody got time for that. If I was going to go cloth, I needed to maintain the ease of use factor that came with disposables. I didn’t have time to fold and pin! There were also people who were cloth diaper junkies. More power to them, but they thrived on “fluff mail” (getting a shipment of cloth diapers) and loved to try out various brands, types, and colors. Also not me – and a massive amount of money. No, if I was going to go cloth, it also needed to be cost-effective. What was the point of doing this if I wouldn’t save money? People recommended buying a few types, just to see what we liked more and then buying in bulk after that. This wasn’t an option for me – I wanted to buy one kind only and put all my eggs in that basket. After much research and consideration and after buying a few more boxes of disposables (which were not cheap), I bit the bullet when the twins were 6 months old and purchased 24 Bumgenius Freetime “snap” cloth diapers. If I had one baby, I obviously only would’ve purchased 12. I feel like this might sound like an advertisement but it’s not – this is the diaper I chose and I’m so glad I did. 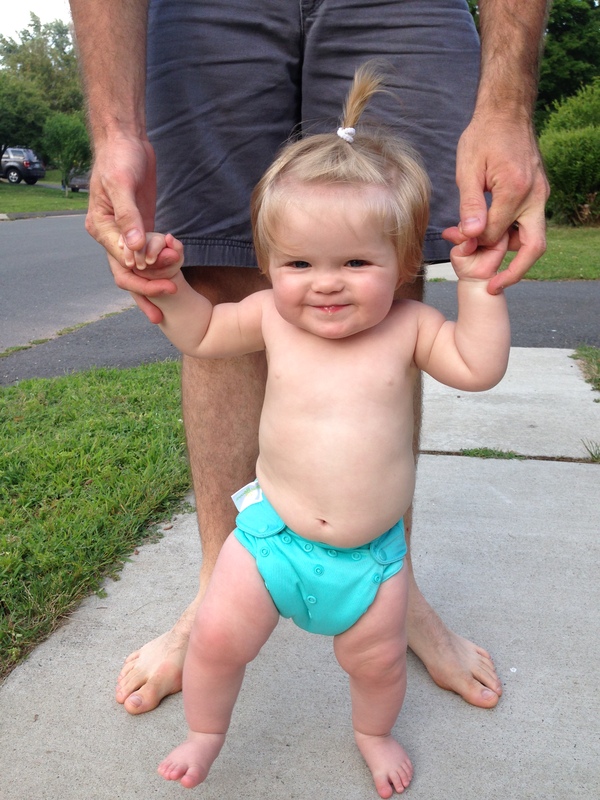 If you’re thinking about switching to cloth diapers, consider this: If you want it to be EASY, get snaps. My diapers have snaps (I’ve heard toddlers can undo their own velcro diapers). These snaps require adult strength to put together and take apart. The diapers also have thick foldable liners built into them – perfect for alternating the areas you need the extra protection. For B, I fold the top flap over in the front so he has lots of padding where he pees in the front. For C, I keep both the padded flaps stretched out, giving her more protection in the back. And the best part of all is that these diapers are adjustable, from 8-35 pounds, from newborn to potty training toddler. I’d only ever have to buy one diaper. And that’s what I did. To keep this post from getting crazy long, I’ll skip the details and save for future posts about how I wash the diapers (no heavy bucket! no stains! ), handle the poop factor (long gloves! fleece liners!) and some troubleshooting tips I’ve learned in the last 12 months. I can tell you that with two kids in diapers at the same time, this was definitely a smart financial decision for us. If we ever have another child (ha! ), we’ll just use these again. And they’re a hot commodity on the cloth diaper market – I have no doubt I’ll be able to sell them for a discounted price, making at least a little money back. 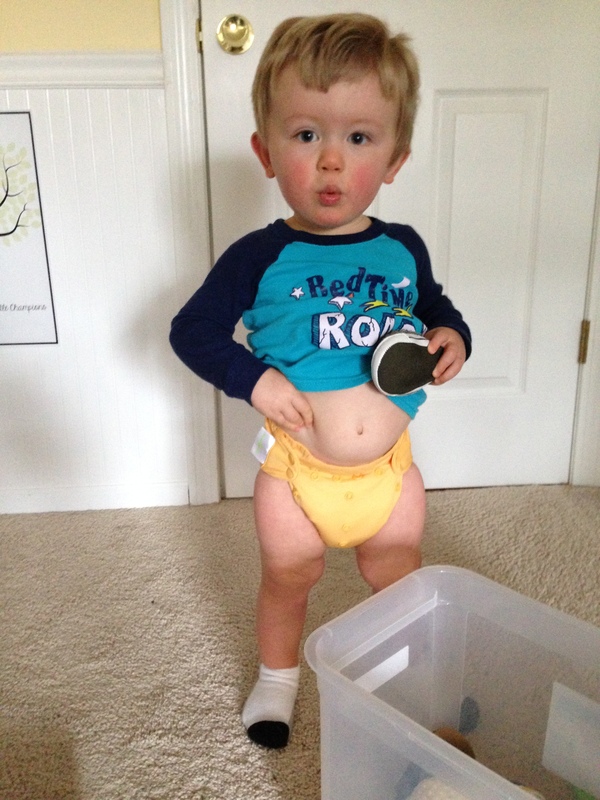 The reason for this post is that I believe these cloth diapers are lending a hand to our potty training beginnings. Not that I’m overly excited for endless “I have to go potty”s and accidents and bed wetting. We’re not there yet, thankfully. But I’ve heard that cloth diapers do speed up the potty training process and so far that seems to be true for us. At a certain age, no toddler wants to be wet. It’s cold and uncomfortable. It’s like leaving a wet bathing suit on for a few hours at a time, except it’s thick cotton. Yuck. 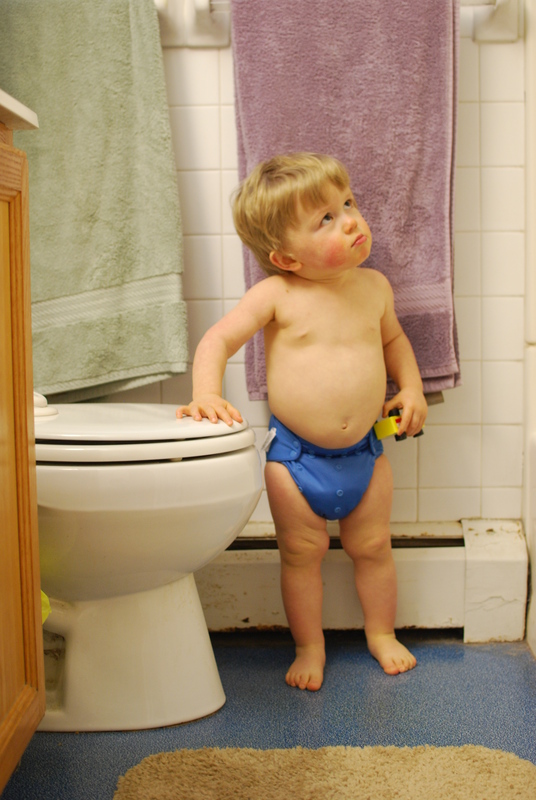 In a disposable, its job is to hold the urine so that you can go longer without a diaper change, meaning that the kids won’t feel it. At least not for the most part. 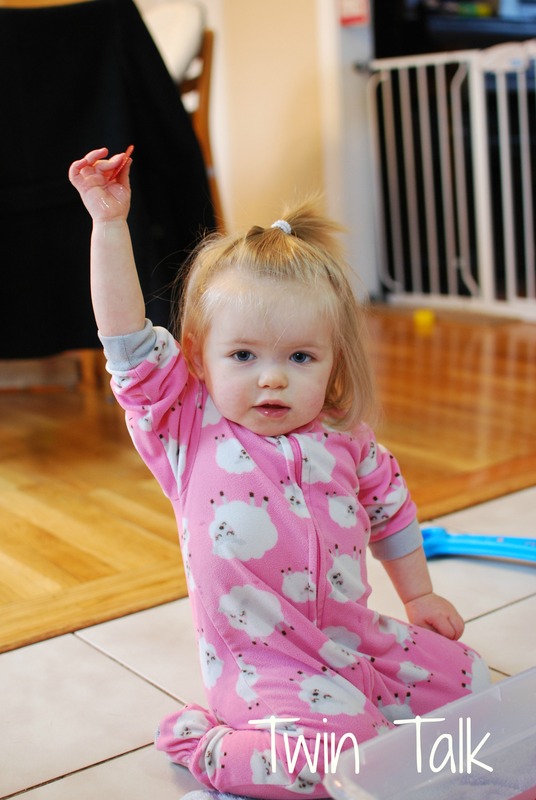 In the last few weeks, C has started declaring that she’s “wet” – holding her diaper and announcing “wet, wet” over and over again. And when I’ve gone and checked her diaper, sure enough, she’s been wet. I think she feels the discomfort from this. I’m encouraging her to keep telling me when she’s wet. 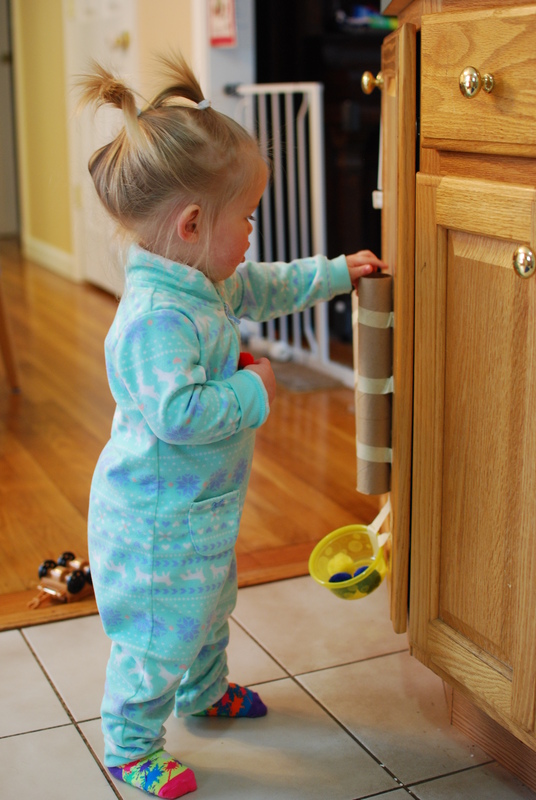 Her noticing this – I take it we’re at the beginning stages of potty training. And for B, he does not tell me when he’s wet yet, but he is now going many hours without going to the bathroom. In fact, he mostly only pees when he’s napping or in the car. But he’ll hold it for hours. Once he goes, he goes a LOT and sure enough, it’s time for a new diaper. I can imagine that there’s nothing worse than a cold, wet diaper. 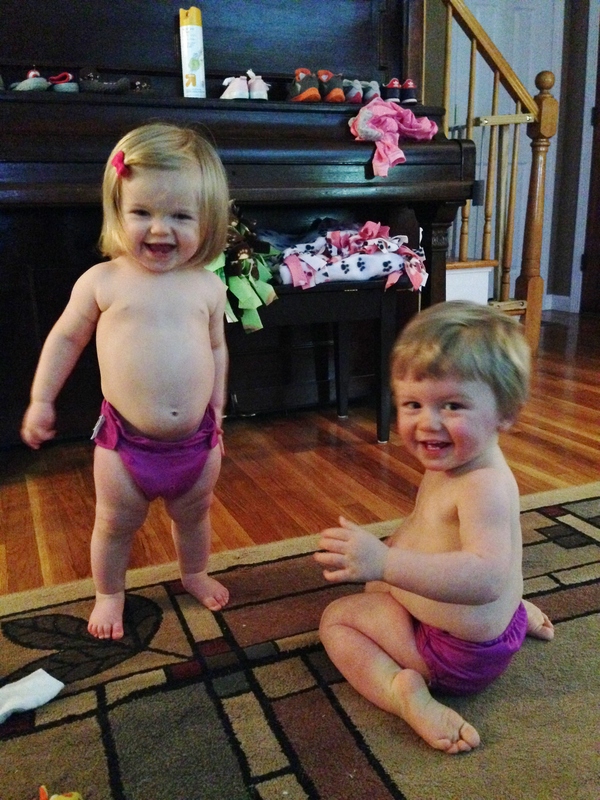 So perhaps our potty training journey is getting a boost, thanks to our cloth diapers. This was soon after I purchased them a year ago. These were from over the summer, 6 months in. 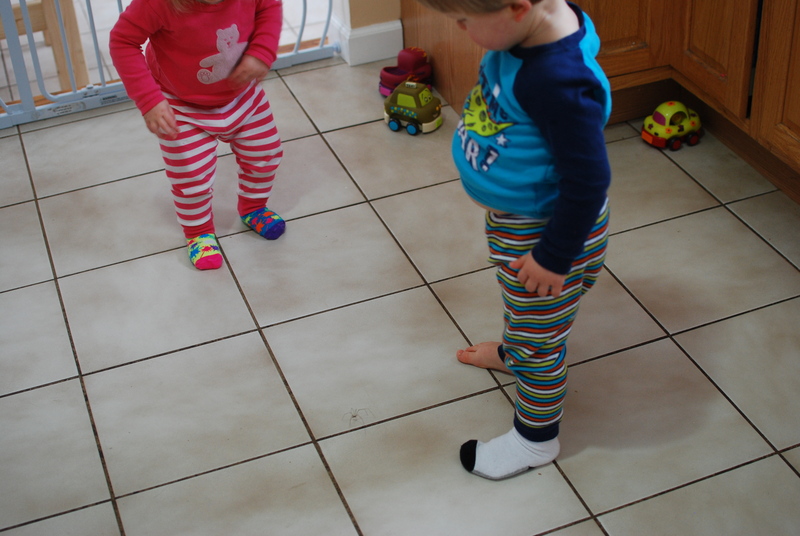 It was a decision I never regretted and in our journey to potty train these two crazies, I’m finding added benefits from cloth diapering I never knew existed. 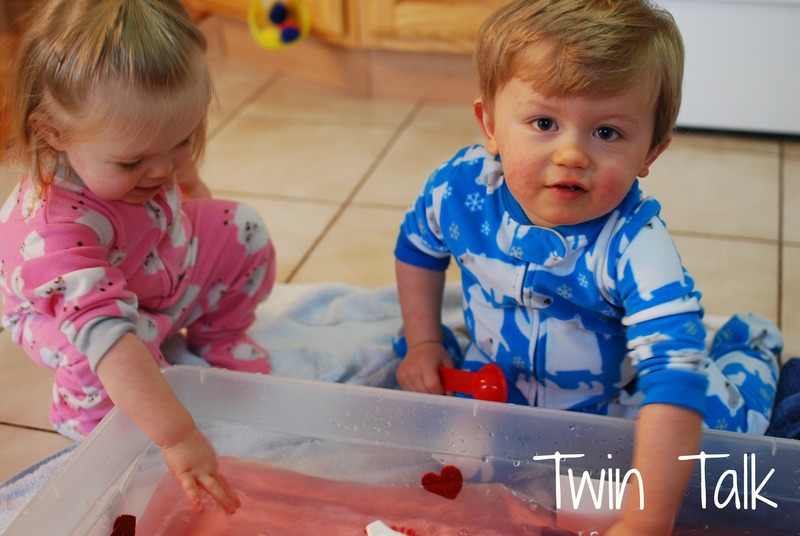 Another day at home by myself with the twins; another reason to find an enjoyable, affordable sensory activity. I’m starting to take a real interest in finding good ideas online and either copying them exactly or altering them a bit to make it work for my kids. I also love the process of picture-taking and then blogging about what I did. Most of the ideas that I find come from other blogs out there, so I’m happy to add myself to the mix to help others keep their little ones busy. 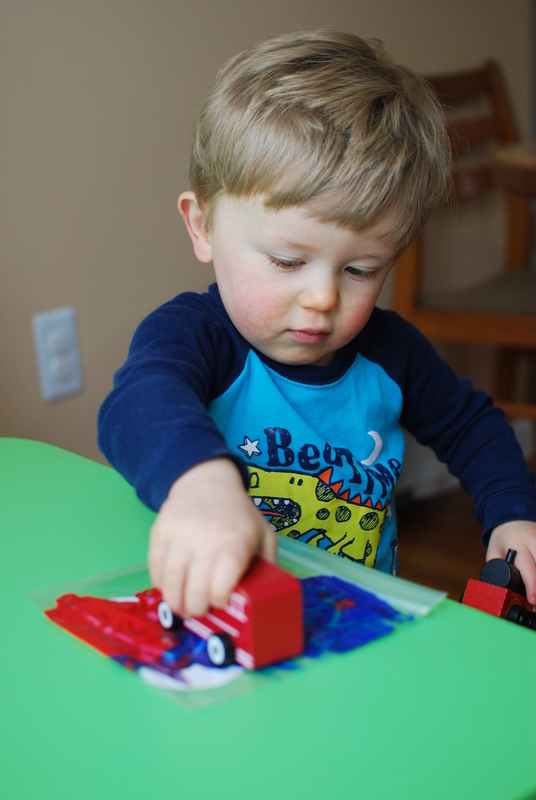 And it’s not just for fun – if I don’t have something for my 18 month olds to do that’s outside of the normal “free play” (because how many hours can we do that? ), they get antsy. Especially B. I find he’s the happiest when he’s exposed to new experiences and activities. 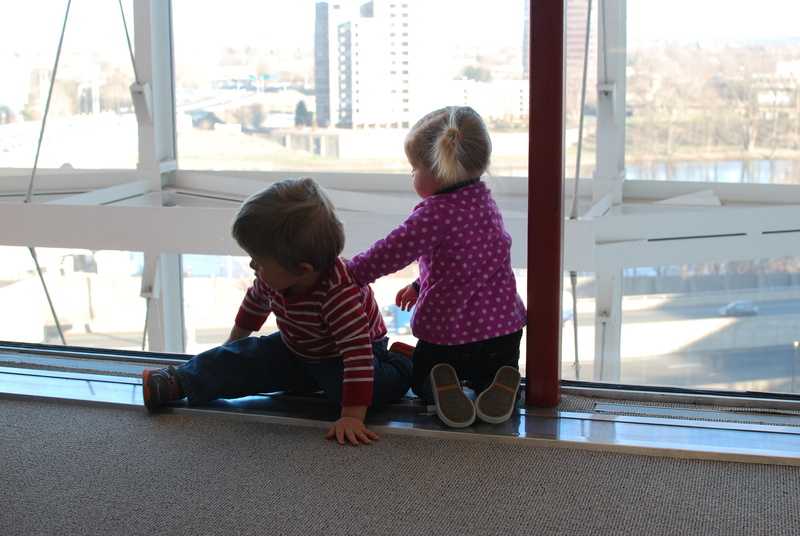 C just goes along for the ride – but it’s just a more pleasant day for us all if I’ve got something planned for them. 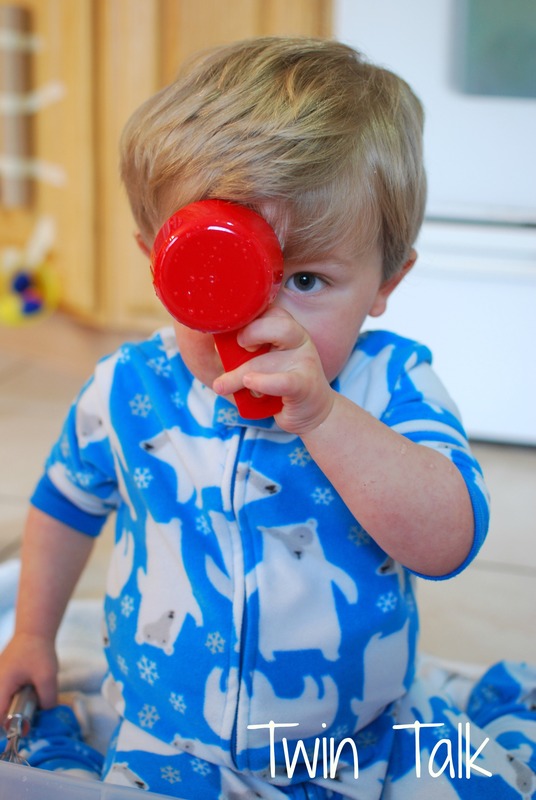 One of my absolute favorite blogs for sensory activities that are cheap and easy is Asia’s Fun At Home With Kids blog. She’s kind of living my dream life right now – a former teacher (ahem), she’s now a stay at home mom who has amazing ideas and activities to keep her two kids stimulated and learning. Then she takes pictures and blogs about them. So jealous. I subscribe to her blog and came across her idea for Valentine’s Day Soup. 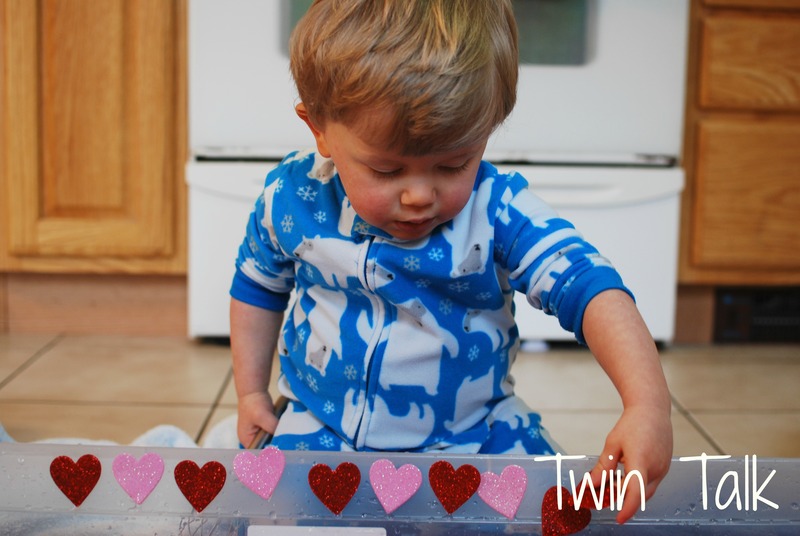 With Valentine’s Day coming around the corner, I’d like to do some crafts and sensory activities with my two that get them thinking about lots of red and pink hearts! 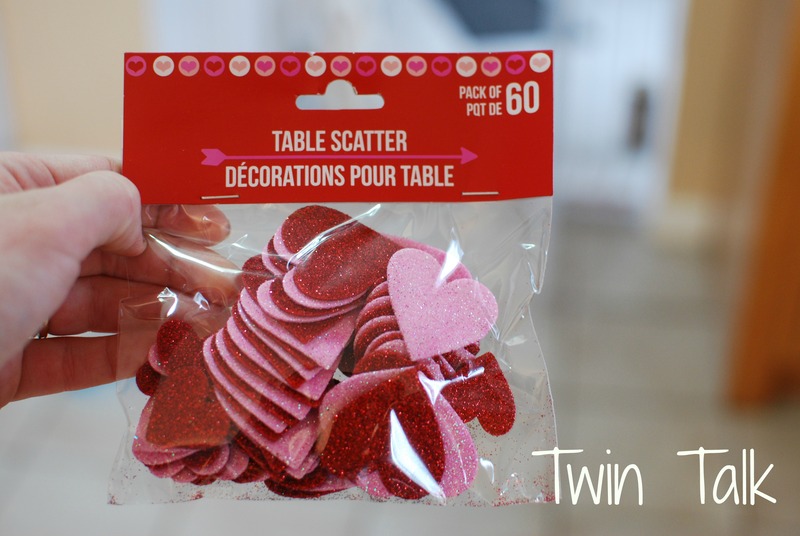 I modeled our water play activity today after Asia’s almost to a T. In fact, I jetted off to the dollar store in search of some play hearts to use in our bin and came across the exact hearts she used as well (“Table Scatter”). 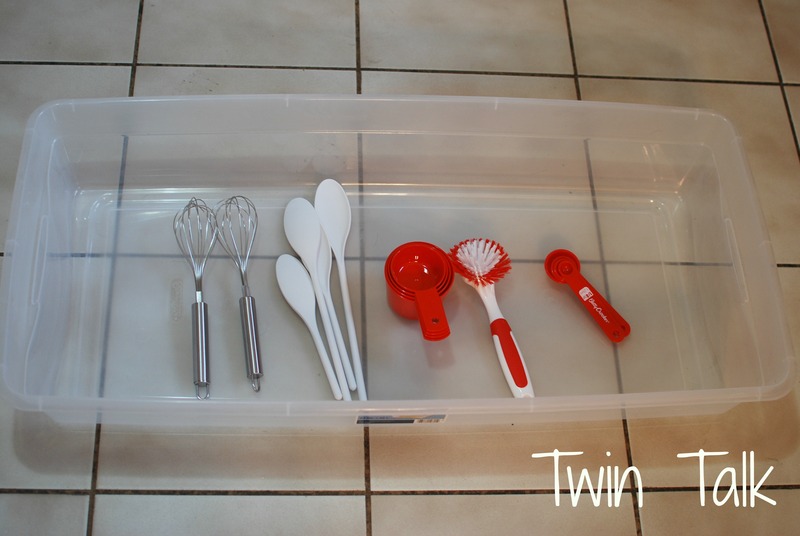 In preparation for the activity, I gathered up some extra kitchen utensils set aside for the twins and used 5 drops of red food coloring in warm water. Now, regarding the mess: Yes, there’s a mess. It’s water play and the kids get wet. I also got wet. I put down two large towels under the bin and kept a hand towel ready to quickly mop up any water that made it past the towels. I put the twins in fleece, so they wouldn’t feel soaked immediately. I got my camera ready and after their nap (1 hour and 15 minutes – grrr), they were ready to roll! Water play is just an extension of bathtime. 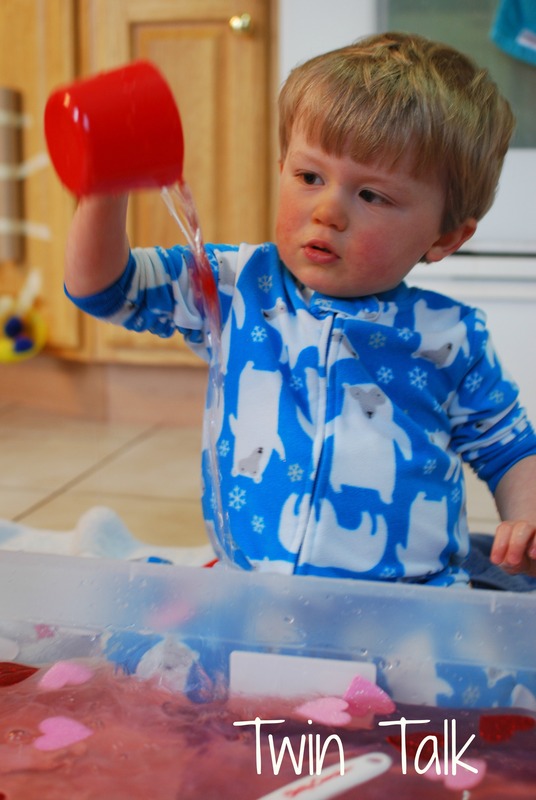 Children get to explore various objects and see how they work and affect water. They can compare sizes and colors. They make observations about wet versus dry. All in one convenient bin of water! 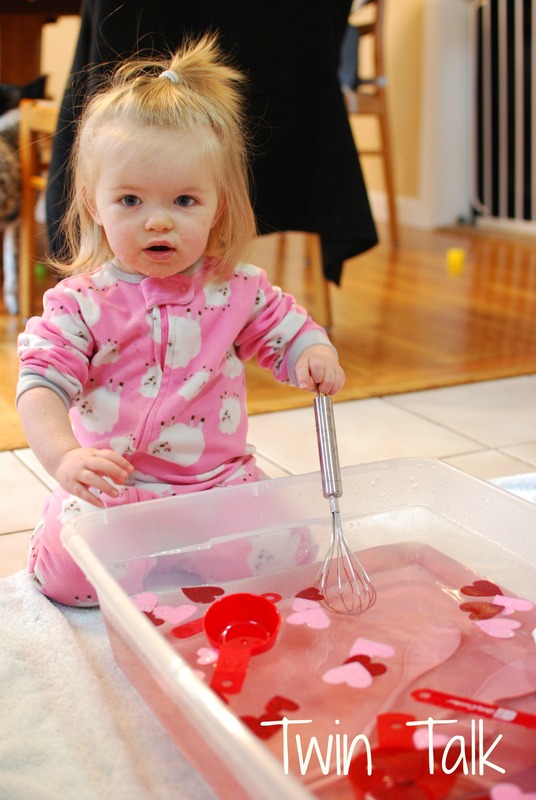 I also like the way this is themed for Valentine’s Day – but you could do water play for any theme imaginable. If I weren’t working full-time, I’d love to do a water play activity at least once a week. It’s worth it – the kids absolutely loved it. As I expected, both toddlers took an interest right away. 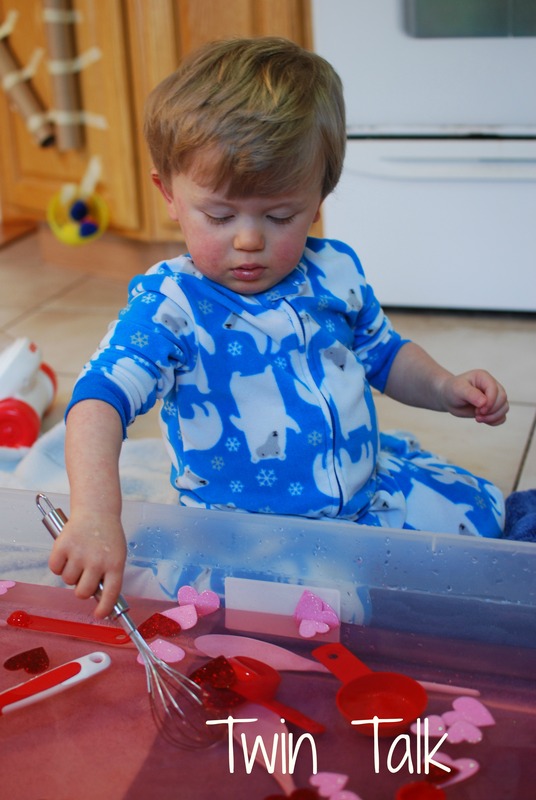 There was a lot of stirring, splashing, and plucking out the hearts one by one, which is great for fine motor development. They transferred the hearts to cups and counted them. They put them back in the water. C tasted her wisk after stirring out of habit, as that’s how she eats with her spoon (stab, stab, stab, lick). We talked about dropping the hearts from high above our heads and seeing what would happen. We discussed patterns (no, B didn’t do that), and practiced “sticking” the hearts to the side of the bin. And then after 25 straight minutes of play, C got up and started doing other things. This was no surprise to me as she typically does this. 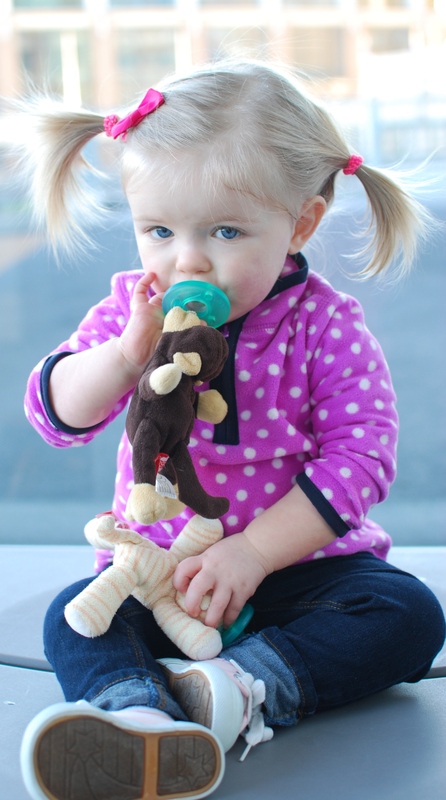 She’s not the type of toddler who sits down for a long period of time. She’d rather explore a variety of toys. Free play works well for her. And also as expected, she rejoined us on the kitchen floor a few more times after that to check in and shove her hands in the water. But B stayed at that bin, stirring, pouring, counting – so focused, so serious, for almost an hour and a half. In toddler time, that’s like 5 years. It made what could have been a long afternoon into a very easy, laid-back, happy one. 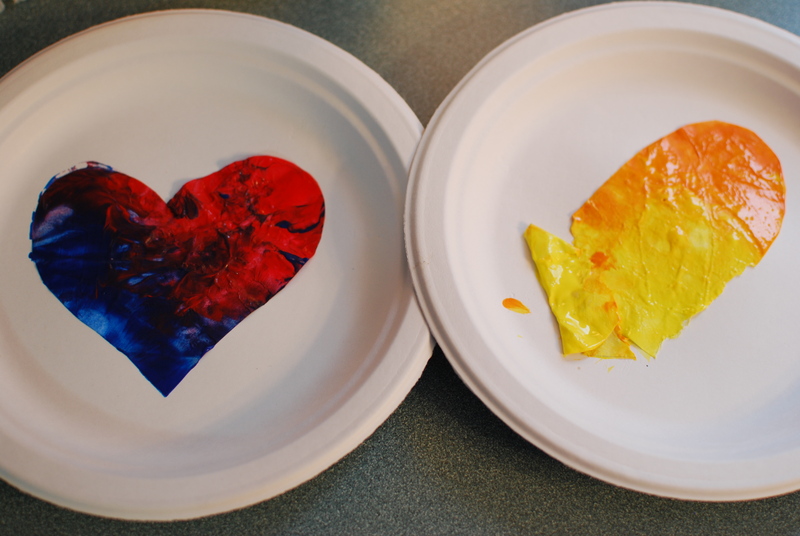 Another successful sensory activity! I wanted to quickly post how we transitioned from two naps down to one. I had been dreading this and had read that it’s the toughest of the nap transitions for babies to make. At the time, I felt very limited by two naps. We couldn’t go anywhere between the hours of 8-11 and 1-4, unless we planned ahead to have the twins nap in the car. I joyfully looked forward to the day that they took one giant, long nap. The twins stopped being ready and tired for their first nap at the ever-so-trusty 9:30. (This was rough at first, because they transitioned to two naps from three early on, at only 7 months. We stayed at the 9 and 2 schedule for so many months!) And then after a few weeks, 10:00 was also too early. We got into a rhythm of a 10:30 nap for a week or so, which would last until 11:45-12:00. During that time, I’d put the babies down for a power second nap around 3:30. I only let them sleep 30 minutes, max. And when they napped that way, they’d go to bed around 8:00. I knew this was just step one in our transition. Then B started refusing his second nap. Even if his first nap was early and he woke at 11:00, he fought and screamed his way through the second nap no matter what time I put him down. For a week there, I drove around whenever I could just to get him to power nap in the car around 4:00. But then he stopped falling asleep in the car. I knew we were on our way to switching over to the one nap. I even started pushing back the first nap a little later, around 10:45, and then 11:00, and then 11:15, assuming the transition needed to be slow and gradual (it does not). 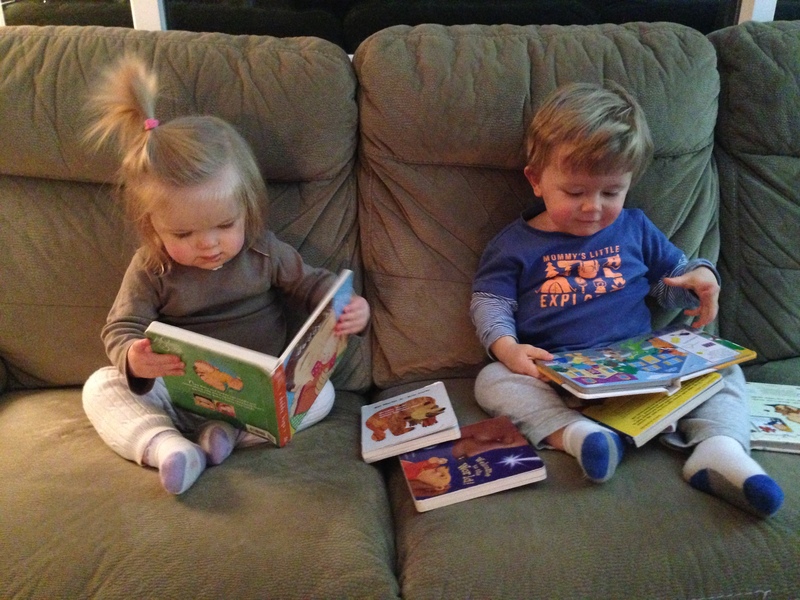 And right in the middle of that, the babies got roseola (with a high fever lasting a week….separate weeks). Two weeks later, they both got nasty colds that turned into bronchitis for B and a double ear infection for C. That was a week in itself. All this illness completely botched up any nap transition we were attempting and we just let them nap whenever they wanted to for as long as they could. When it was over, I decided to bite the bullet and go for a normal-timed one nap. I moved lunch up a half hour to 11:30 and they currently nap around 12:30. It’s been over a week, and there’s no turning back now. Our two nap days are totally over. Unfortunately, I was envisioning two kids who take a three-hour nap. I don’t believe I have those kinds of kids. C has slept for 2.5 hours a few times, which is lovely and I will let her sleep as long as she can, but it doesn’t give me any rest if B isn’t doing the same thing! B’s longest nap now has been 1.5 hours. Most days it’s between 45 minutes to an hour. I understand that this isn’t normal. So either he’s in a bit of a Wonder Week (which supposedly at 18 months is a thing) or he’s still getting accustomed to this transition. Either way, I’m now regretting wishing for 1 nap. We’re on baby duty from 7:00-12:30, and then 1:30 until bedtime! Where’s the break? I’m really hoping B learns to nap for a longer period of time over the coming weeks. We’ll see. The one thing I can say and recommend to anyone about to embark on this transition is to move bedtime way up. 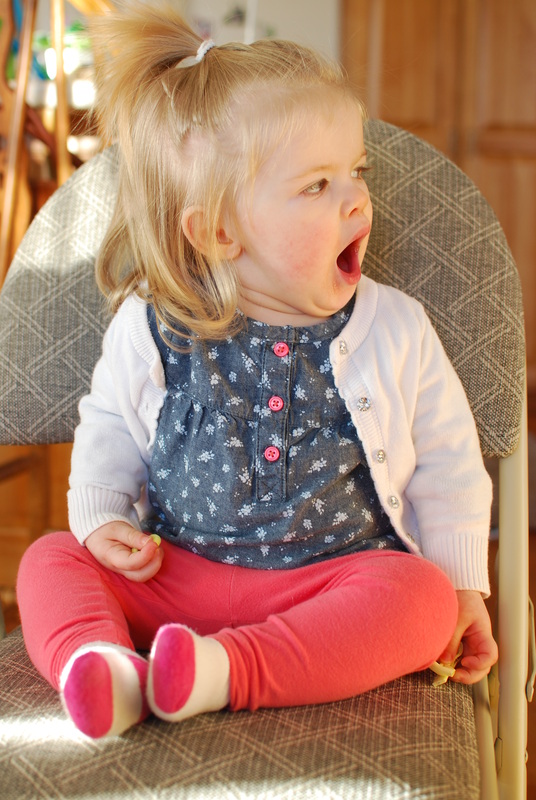 When kids first start taking only one nap, they’ll be tired by 6:00. It’s been a challenge for us but we’re attempting a 6:30 bed while this is still in transition. Most nights it’s more like 7:00, especially if they took a good nap. Tonight, after only an hour nap, we had them sleeping for 6:45 and it really should have been earlier. They would’ve easily gone down. And I’m sorry, I love those twins more than life itself, but there’s nothing more satisfying than closing their bedroom door at night and breathing a sigh of relief. The earlier the bedtime, the better! It’s tough growing into big kids! I figured, since this has happened the last two nights in a row, and a handful of other times before that, I’m a pro now and can therefore write a blog post on the subject. How do you, exactly, give two toddlers a bath when one has a poop ‘splosion? As I’m upstairs prepping their bedroom for nighttime, I hear “Abort! Help! Mama!” This is my husband in his desperate plea for my assistance. I run downstairs, I burst into the bathroom. Two toddlers are still sitting in the tub while poop starts to separate and float in all directions. They start to point and reach. We throw down towels. Pick up one toddler, dry off their feet and legs at least. If not, they’ll run out of the bathroom and slip on the floor, and yes this has happened (twice) and yes we felt terrible. 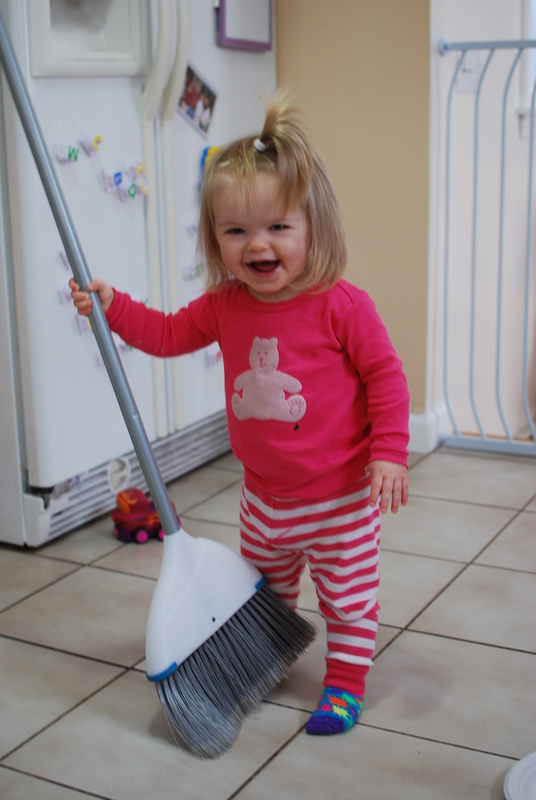 Pick up other toddler, dry off feet and legs. They run squealing out of the room. Husband keeps an eye on the naked toddlers sprinting around the house. The tub is draining. SO. VERY. SLOWLY. I bare-hand the big pieces (with a piece of toilet paper, which doesn’t work at all) and chuck them, dripping, into the toilet. I’m in a rush so I forget to roll my sleeves up. My work shirt gets wet with poop water. My socks are soaked from the water on the floor. C brings me the paper towels about 5 minutes too late. I use them anyway to pull back the chunks and pieces of toilet paper from the drain. After a few rounds of this, I start to become de-sensitized. I mean, there’s whole pieces of whatever they ate floating in there. I start to see food rather than poop. I get more paper towels. I clear the tub drain. I gather more chunks. I pluck out the 57 toys that were in there and toss them into a bucket or in the sink to be bleached later. Why do we have some many damn toys?? B comes in and watches the little chunks slowly drain. “Oooh!” he comments. I say, “Yes, that’s yucky. See the water spinning?” “Yuh” (yuck), B replies. He nods in agreement, the water is spinning. Truly fascinating. Finally the water is gone. I take more paper towels, do a quick wipe to get the last pieces out. I spray the tub with a tub cleaner. I wipe it. I rinse the tub out with the shower nozzle. Put the drain back in. Start the water. Find new toys. Get two babies covered in dried up poopy water back in the tub for round 2. Check the floors for any pee that may have escaped while the naked hallway races were going on. Keep the dogs away, as they’re dying to sniff and inspect. Start washing toddlers. Pray the other one doesn’t poop. After it’s all over, I tell myself there’s no way this could happen again tomorrow night. It’s times like these that I really feel like a parent. This is what we signed up for, right? 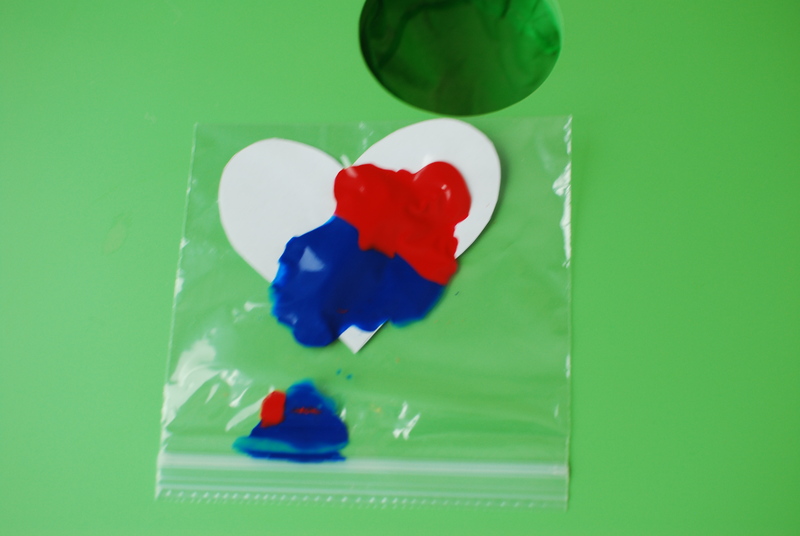 First, I cut out a few hearts and placed them in two ziplock bags with some paint. After sealing it shut and getting all the air out, I let the twins go to town squishing the paint around inside the bags. B even did a bit of driving on his bag with his cars. Unfortunately, this activity didn’t last long. For one thing, I didn’t have any thicker paper or cardstock, so I had to use computer paper, which was too flimsy and therefore ripped. More than that though, the twins were obsessed with the paint and C was upset that she couldn’t open the bag and get her hands on some bright colors. So I dug through our “busy bag” bin (more on that in another post) and found the markers. 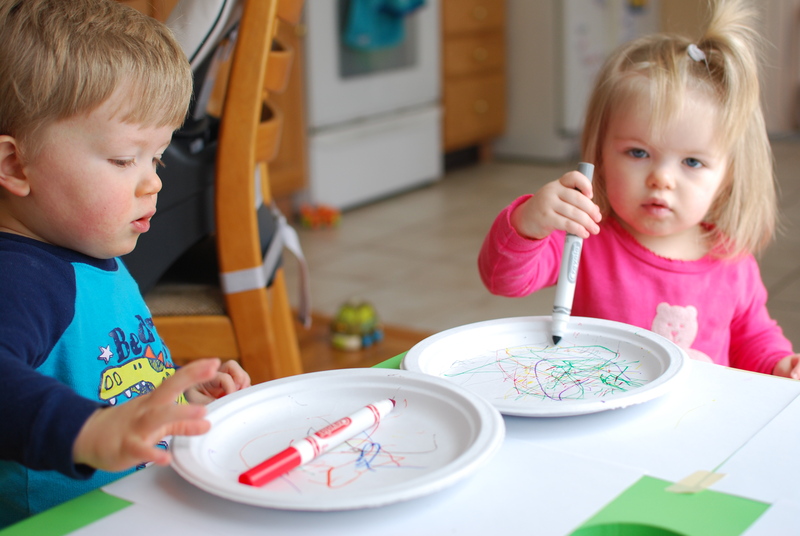 This hit the spot: the twins loved coloring on paper plates. I couldn’t uncap the markers fast enough. C really enjoyed dotting her plate as she does with her spoon when she eats yogurt. B though figured out what I was doing with the caps and desperately wanted to try it himself. This involved lots of marker all over him as he grabbed both ends of the marker. So this activity lasted a bit longer than the last one, but no more than 10 minutes. Two activities already and it was only 8:30! 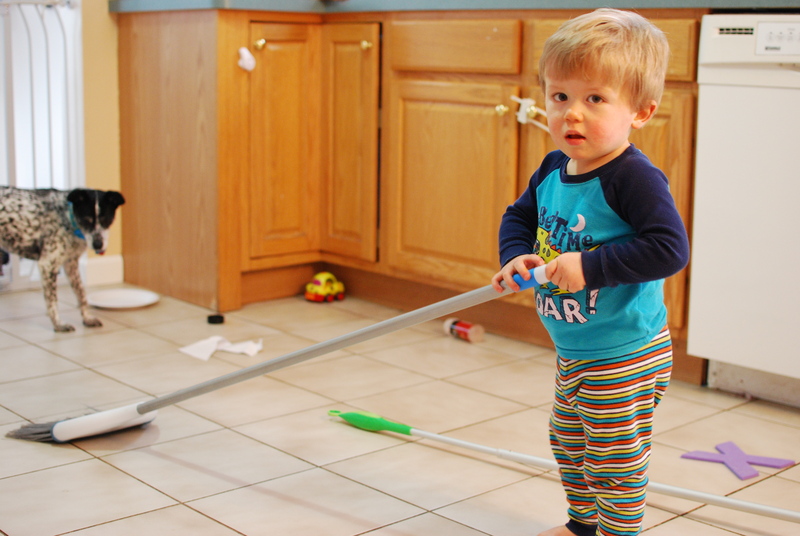 While I cleaned up the kitchen from the first two activities, I gave B and C two brooms and encouraged them to push and “sweep” a few more paper plates around the floor. After switching their brooms a few times, they had a good time with this one as well. Then we found a spider. Now, I don’t do spiders. But I’m attempting to be a good role model and not stamp my feet and throw a fit when I see a bug. So I allowed it to crawl around the floor as we sang “The itsy bitsy spider”. 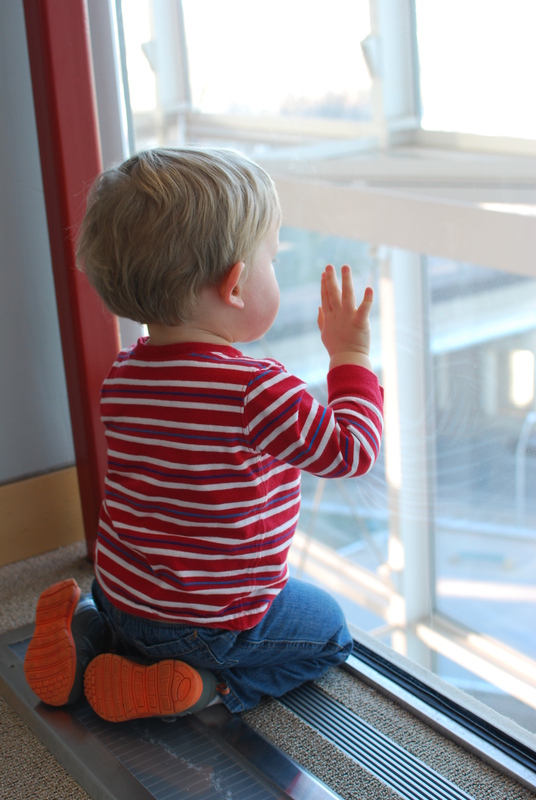 The babies loved the spider and waved to it many times. We continued with our day, taking a break so I could browse Pinterest for some quick ideas for what to do next. I found a lot that involved some pre-activity work from me, which was time I didn’t have. So instead, I used a free resource that we had on hand – snow. Being that it was cold, raining, and the babies are recovering from bronchitis (B) and a double ear infection (C), we weren’t going outside. So I brought the snow to them. 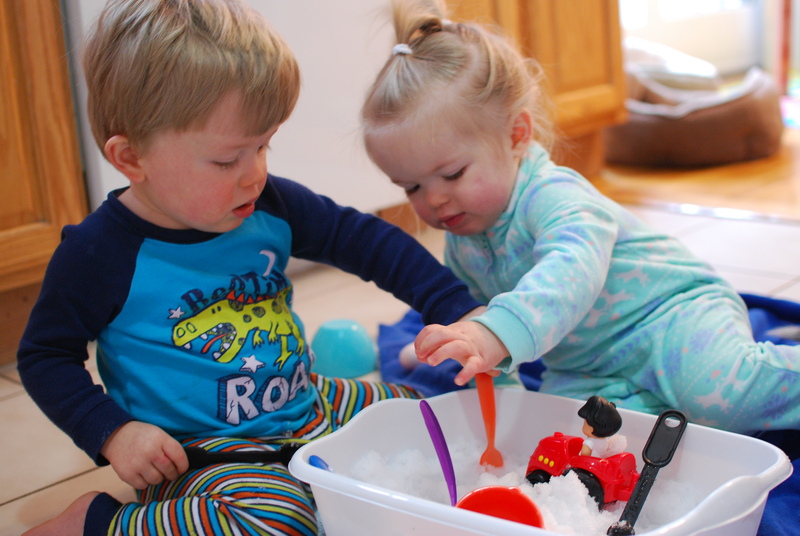 After laying down a few towels and gathering up lots of measuring spoons, cups, and other items, we explored a snow sensory bucket right on the kitchen floor (also the home to our spaghetti bin party). This was the hit of the morning. 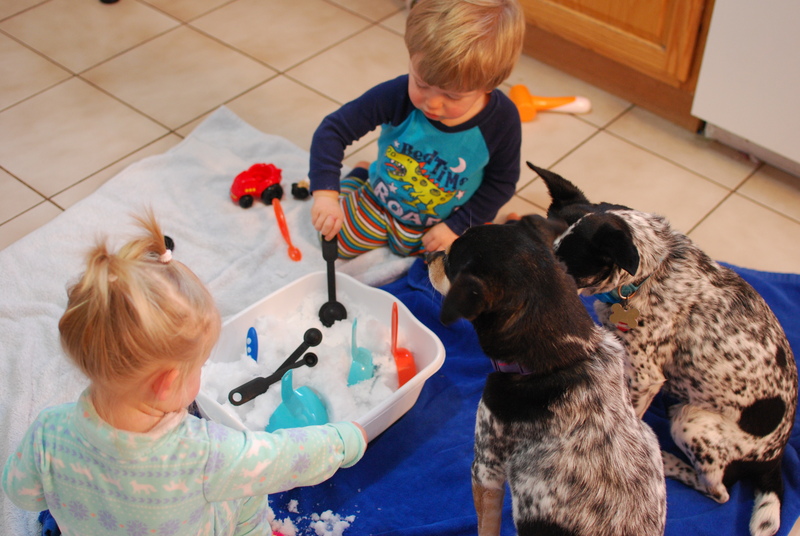 C enjoyed many tastes, and B intently sat there for a good twenty minutes, maybe even a half hour, just digging and stirring and transferring snow from bin to cup. He really enjoyed this. The dogs got a little crazy, but in my house that’s nothing out of the ordinary. 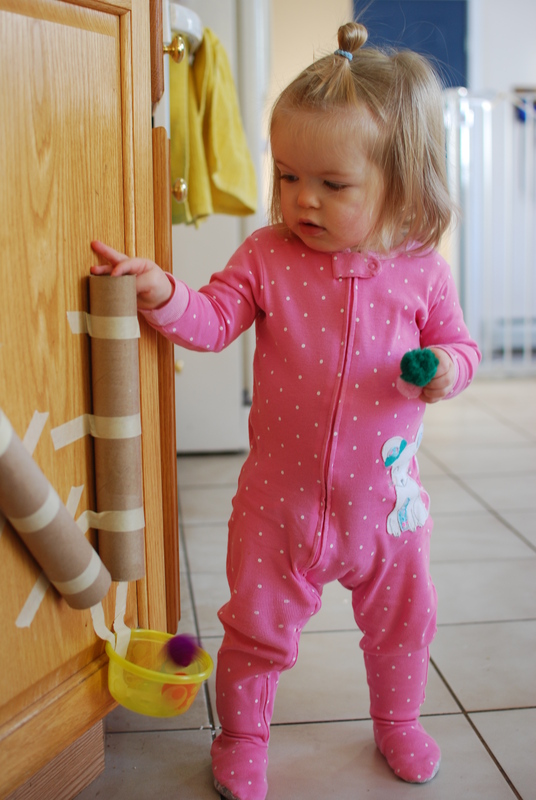 When C got bored, she wandered the kitchen and played a bit with another super easy and cheap activity for toddlers: a paper towel tube and pom-poms. She plays with this one often actually. 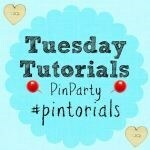 Speaking of pom-poms, I can’t say enough about all the things you can do with them! They come in all sizes, which is nice. 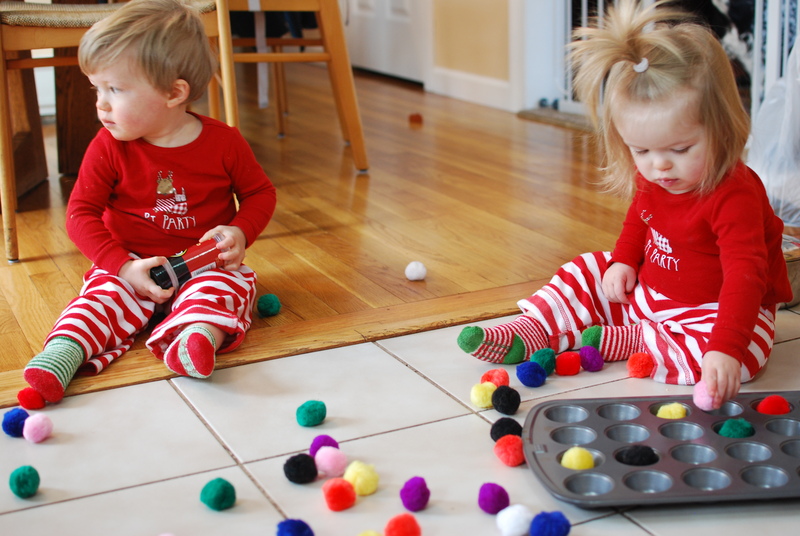 For the most part, I limit my twins to the medium and large sized pom-poms as they still put a lot in their mouths. But really, the possibilities are endless. Well, the twins are a week or so away from being a year and a half old. And they are certainly acting like it! So many amazing things are happening with this age group, and yet the challenges are just as numerous. I was under the impression initially that having twins gets easier. The management of having two babies does get easier, in a sense. I strap them both in at the table and put food on both their plates and they (sometimes) eat. I scoop them both up and bring them up or down the stairs together, or if I’m feeling extra patient, will let them take a few stairs (which takes about 17 hours). They bathe together, they play fight together. And they understand so much more – in fact, I’d say they understand almost everything we say to them. Even if they don’t have all the words to express what they want to say, I can say, “Go find Daddy in the bathroom; it’s time for your bath.” A few steps will be taken until they realize what they’re going in the bathroom for, and then the chorus of “no, no, no, NO” will begin. Or I’ll say, “Please pick up the dog bone. It’s over there, behind you. It goes in the basket. Put it in the basket please!” One toddler, in my opinion, would be challenging. Especially a toddler like B. 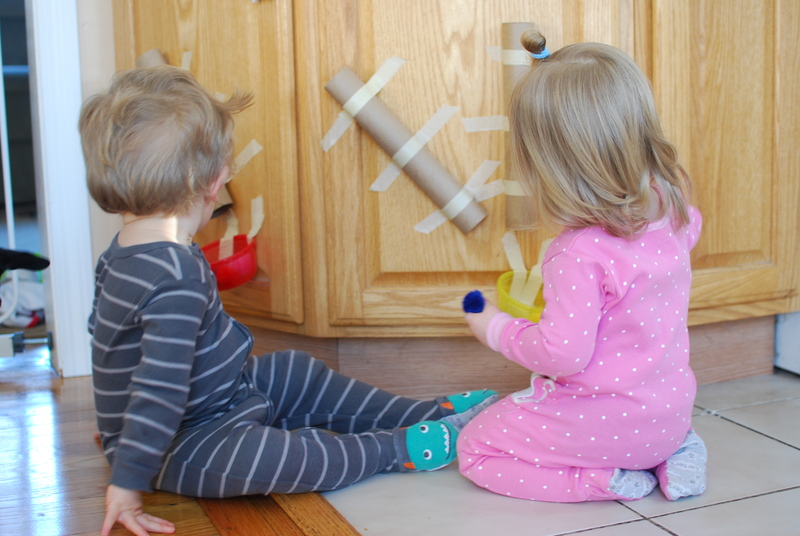 Therefore, two toddlers is doubly as challenging. I’m admitting here that I’ve recently googled “18 month old temper tantrums”. C does not throw them. B throws them. Granted, being hungry, tired, or sick has only made it worse, but that boy really knows how to be upset. And that for me is sometimes a challenge. Meals right now are a shot in the dark – it’s anyone’s guess whether either baby will eat what I make for them. Tonight they had a simple turkey “quesadilla” and a sweet potato for dinner. Surprisingly, C refused the sweet potato but ate almost the whole quesadilla, and B refused the quesadilla and yes, ate the whole sweet potato. I really just never know. They’re stuck in a food rut of rotating between rice, pasta and quinoa and whatever I put on them – their favorites are tacos, minestrone soup, or “fried” rice flavors (soy and sesame sauce, etc). But heaven forbid they eat a piece of meatloaf or chicken! The constants that I can count on them always eating however are their veggies (peas and green beans…so hot right now) and their afternoon smoothie (with fruit and spinach). So if they drink their milk, drink the smoothie, and eat their veggies, I at least feel good about them getting a little nutrition. But it’s frustrating sometimes. And now, at this age, if the food isn’t what they want, they cry and pull at their straps and say “NO”, and “DOWN”, and “ALL DONE” and the meal is over. They’re very headstrong to say the least. B has seemed to enter another Wonder Week – which I never would’ve bought into if it weren’t true EVERY TIME. He seems to be more sensitive to his growing brain than C is. He continues to want everything he can’t have. He is passionate about everything, so a million times a day, he’s either super excited and happy or super devastated that he can’t have/do what he wants. His meltdowns have been a daily event. 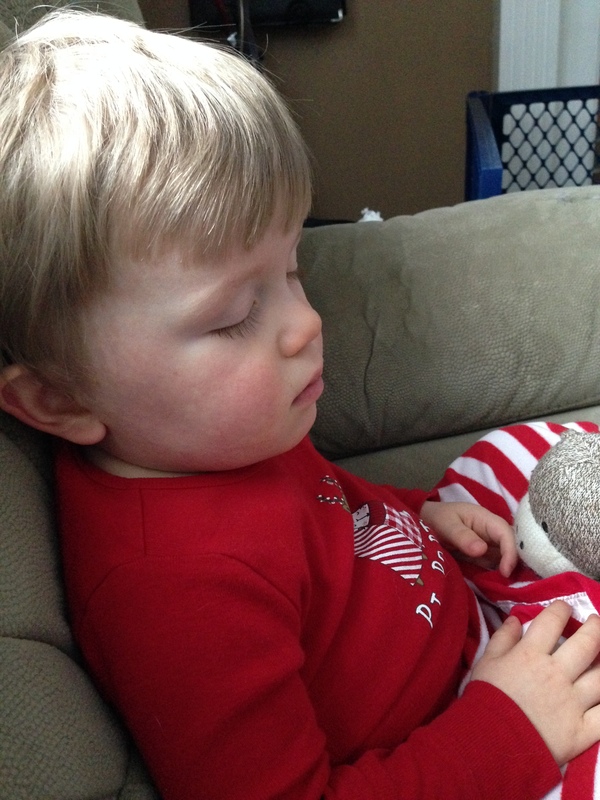 His sleep hasn’t been good either – he is taking one nap, but it’s only 30-60 minutes long. All day. That just won’t do – he’s not rested and he’s crying and fussy. So I’m chalking it up to a Wonder “Week” plus a bout with roseola that lasted a week and now a nasty cold. C doesn’t have meltdowns and she doesn’t bite or hit, thankfully. But she’s no shy, gentle little thing. She’s got sass, she’s feisty, she’s super opinionated. 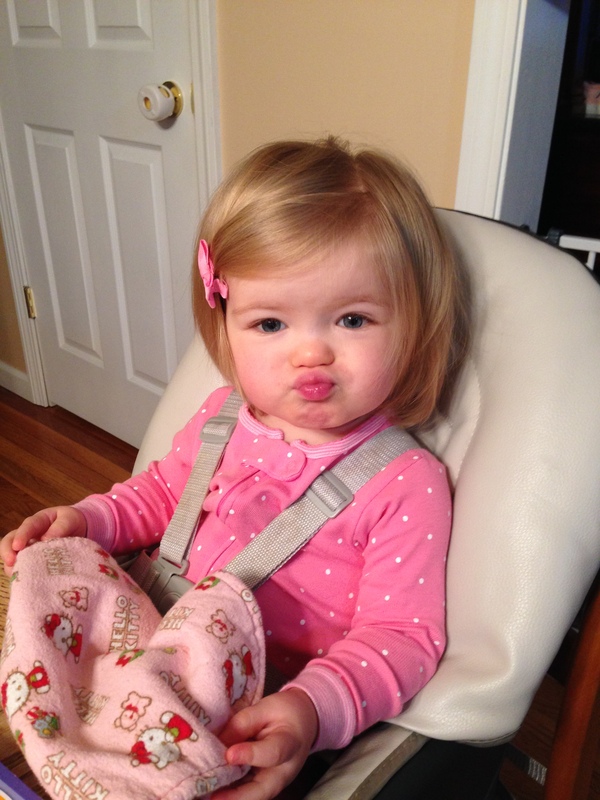 “No” is definitely her favorite word and at this point, it’s still cute to watch her little lips form the word. I know it won’t always be cute when she’s screaming it at me. 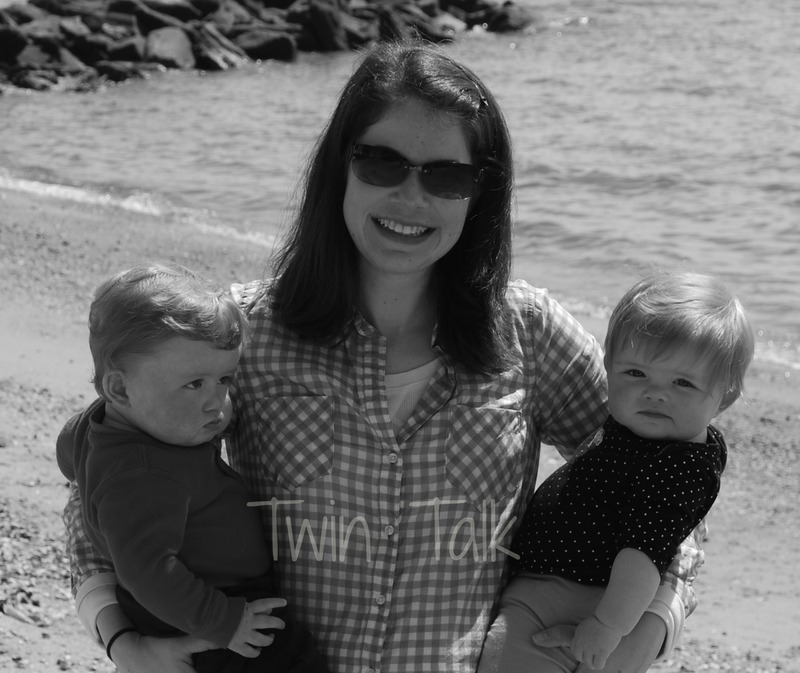 Independence is something the twins are craving and my husband and I are very supportive of. 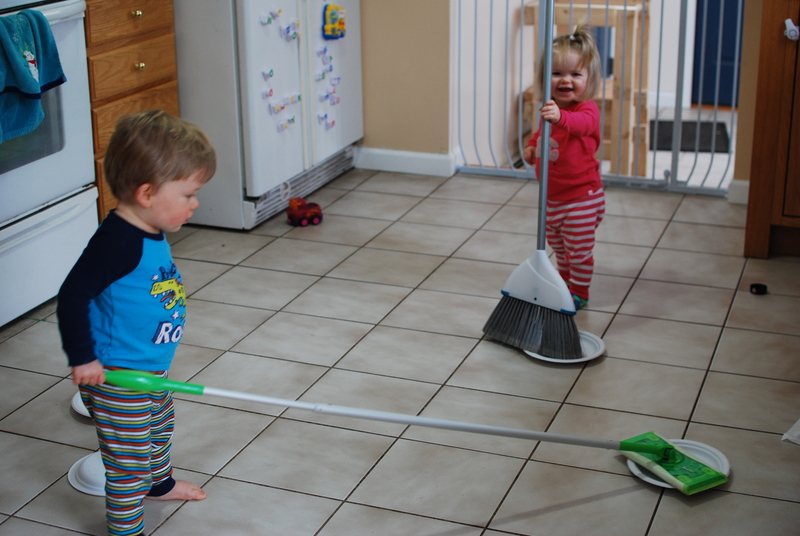 It’s hard, with twins, to give them more independence because it’s hard to keep an eye on both of them at the same time. 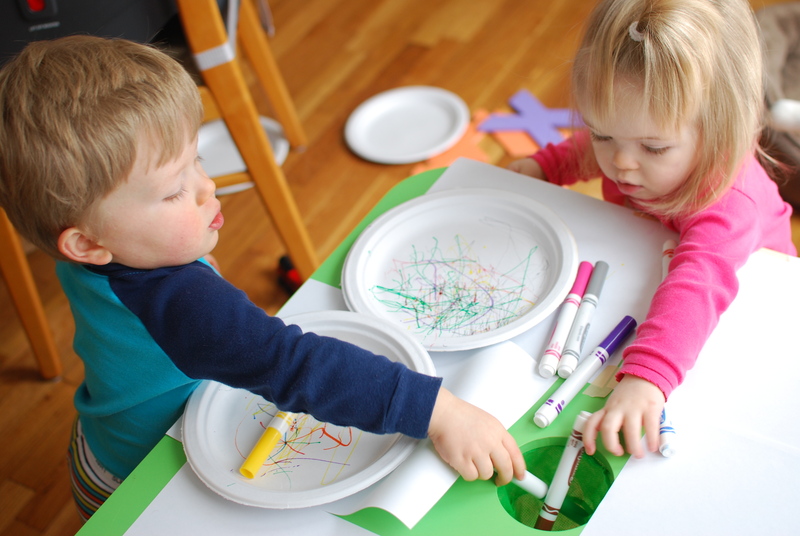 It’s easier for ME to have them do and play with what I want them to, because I can keep them in one space together. But when we are able to give them more independence, we do. C is starting to tell me she’s wet in her cloth diapers, which seems like a step in the right direction. B wants to have his diaper put on while he’s standing up. 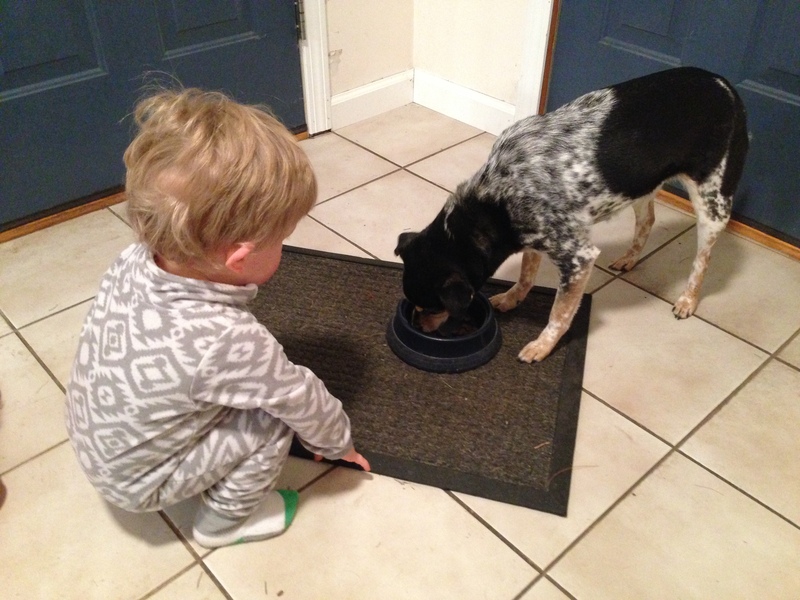 They want to feed the dogs, which is challenging with two toddlers. 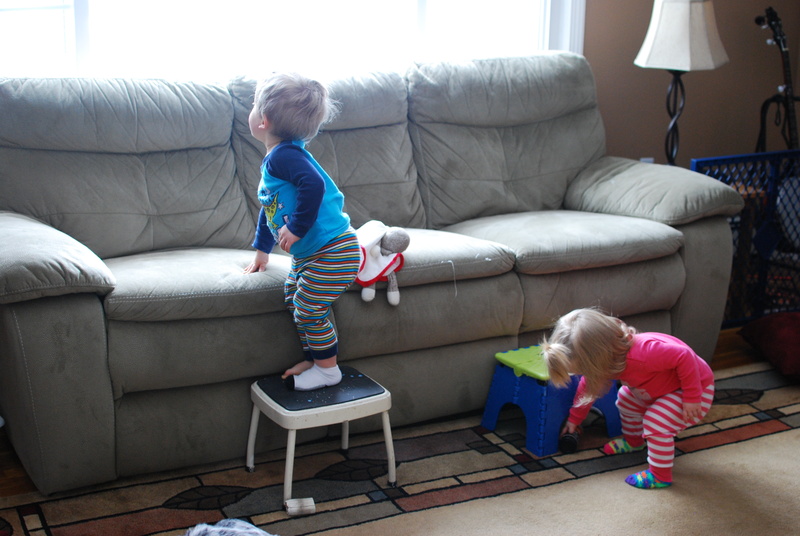 They want to turn the TV on, climb the stairs, turn on the lights, pick out their clothes empty out their drawers, etc. And that’s great and wonderful because that’s what toddlers are SUPPOSED to do – it’s just SO extremely exhausting for me. But oh well, that’s just how it’s going to be. I’ve got future blog posts in the works regarding a few “crafts” to help with independence, including buckle pillows, zipper boards, and my amazing husband is in the process of building two “learning towers”. Big things are happening in this house! And with all the challenges and the absolutely knock-you-down exhaustion comes so many rewarding things. Their language is absolutely taking off. What was a “mo-mo” (monkey), is now “muckey”. 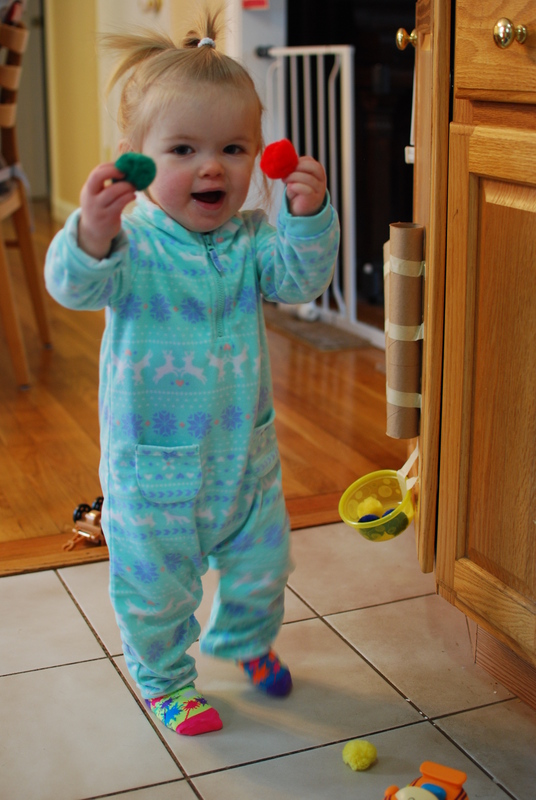 C put two words together for the first time the other day – “Hat OFF”. They know almost the whole alphabet and can count to 10. They do “ring around the rosie”, “If you’re happy and you know it” and they know all the body parts that get washed in a tub. I know these are things all children do and so in one sense, it’s just the next step. But it’s just so cool to watch the change happen, because it happens REALLY quickly. Much faster than I would’ve thought. 10DPIUI is the worst day of the TWW.